Get unified browser management across all platforms through one central cloud portal. Learn more. Looking to better manage legacy app access? Learn about Legacy Browser Support. Give users the freedom to work when, where, and how they want while keeping your business data safe. See the benefits for yourself. Find the right bundle to deploy and manage Chrome Browser for your enterprise. Sync quickly. Stay productive. Protect users from vulnerabilities and threats. Chrome Browser gives you central management capabilities across any OS, including Windows. Security is important because what we do is so sensitive. Chrome Browser helps us to manage security across every touch point, every laptop, every user in our organization. Chrome Browser continuously improves security, helping you safeguard customer and business data across your enterprise. Advanced malware and phishing protection gives employees a safe cloud experience. Users are protected from the latest security vulnerabilities — no patching required. Prevents malware and isolates malicious web pages that try to infect devices, monitor web activity, or steal data. Makes it harder for untrusted websites to access or steal information from accounts on other sites. With Chrome Browser, users can access the full power of the web and customize their experience on any device. Unified user experience across different devices and operating systems. Easy to customize the browsing experience to fit each user’s needs. Support for all users across all Windows, Mac, Chrome OS, and mobile devices. G Suite, Office 365, Salesforce, Workday, SAP Fiori, UberConference, and more. Chrome Browser helps manage employee activity in the cloud, across all devices and platforms, now and in the future. Allows granular browser-management policies at the user level in your current management environment. Single destination for managing browser policies and settings across all Chrome Browser users. Provides control over Chrome Browser’s update cycles to keep pace with your organization’s testing requirements. Dynamically redirects to a legacy browser for specific apps as necessary. Connecting supermarket workers with Chrome Browser and G Suite. Improving employee productivity and mobility with Chrome Browser and G Suite. Streamlining the tax return process safely for all customers through Chrome Browser. Get a quick overview of Chrome Browser’s benefits and features for enterprises. Explore Chrome Browser’s industry-leading security measures. Find out how IT administrators can use Chrome Browser to help employees work more efficiently. See basic steps for deploying Chrome Browser in your environment. Use this extension and allow your users to easily switch between Chrome Browser and other browsers to access older websites and apps. Discover a few helpful hints to stay extra secure. 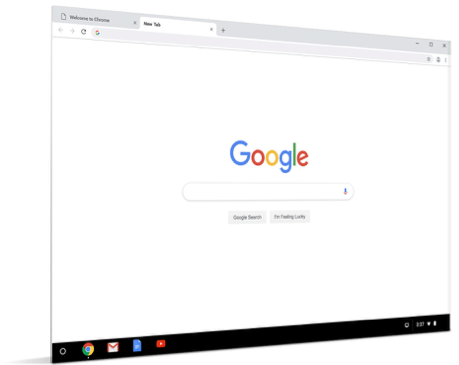 See how additional support from Google can help you smoothly manage Chrome Browser across large enterprise environments. An ESG video on how Chrome Browser can simplify workflow for large corporations.